MAC’s Weld Zone Profiler is designed to monitor the weld quality of a tube by depicting the “profile” of the completed weld. Unacceptable weld profiles can indicate potential problems associated with irregularities in the scarfing and trimming process, a reduction in the weld size, and other anomalies which compromise the performance of a welded tube. This system incorporates our Echomac® FD electronics, with custom Echohunter® software for profile monitoring, ultrasonic test head mechanics, pillar and guide unit, 1 transducer providing 1 channel for wall/weld profile, downstream video monitoring, and an optional off-line calibration station. Pillar and gantry unit for support and stabililzation of test head. Special ride shoe to withstand harsh environments. Couplant for UT using bubbler technique. Custom designed test head scans the weld zone. A-Scan display of profile waveform and strip chart profile view, tracking and recording. 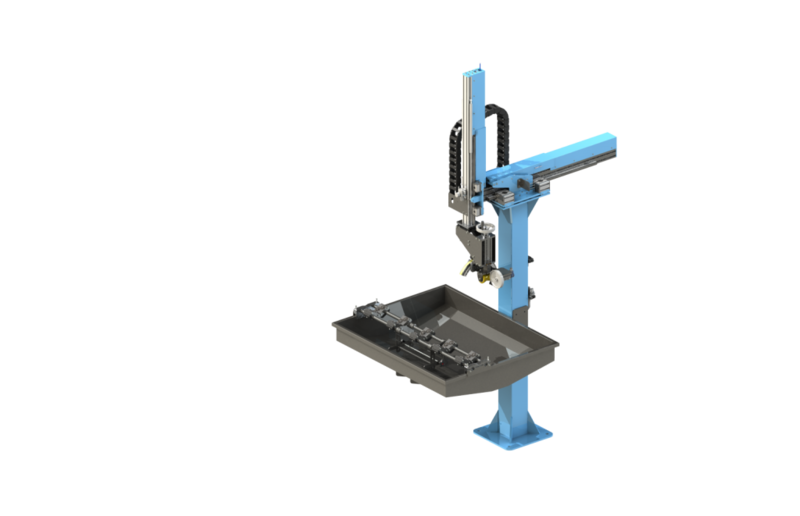 A robust pillar and gantry unit supports and stabilizes the transducer test head and positions it onto the weld line for mill testing, and off line for easy calibration of a new tube size. MAC’s custom-designed test head rides on the tube surface, oscillating back and forth across the weld area while performing the scan. The transducer is mounted in a special ride shoe which is designed to withstand especially harsh environments and the sound beam is coupled to the tube through a short water column using the bubbler technique. The Echomac® electronics and Echohunter software integrates a UT setup parameter panel, A-Scan display of profile waveform and strip chart profile view, tracking and recording all into a single program for ease of use. Production data can be saved and/or transferred to disc or Ethernet. Printing of setups, wave forms, or strip chart recordings can be done with the push of a button. Summary reports are given at the end of a production run containing the total number of pieces, length tested, number of rejects, time and date stamp, along with material and customer information. Trained and experienced MAC engineers can provide you with more information on weld profile testing.